U.K. And EU Finally Agree On Brexit Text, But It's Already Getting Slammed Negotiators for the U.K. and the European Union have a draft agreement laying out how the U.K. will leave the EU next March, but the agreement still needs to be ratified by both parties. 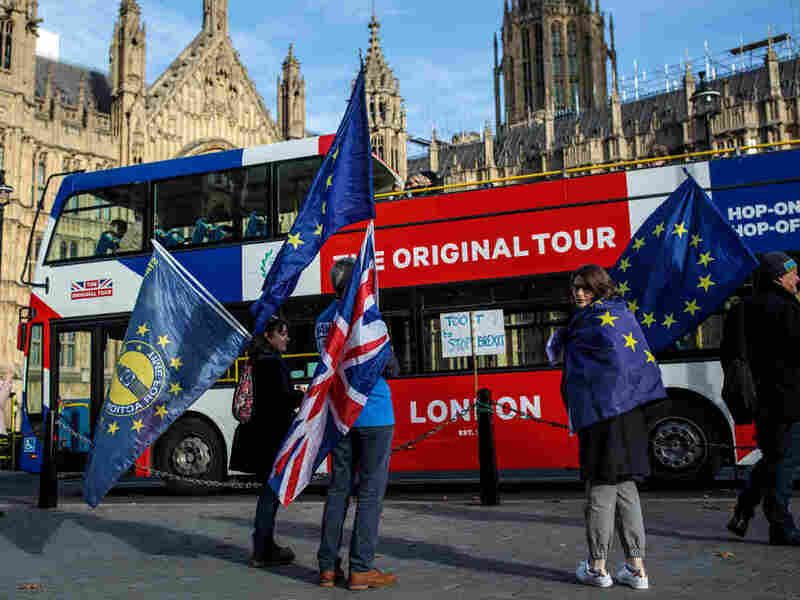 Pro-European Union protesters demonstrate against Brexit outside the House of Parliament on Tuesday in London, as Prime Minister Theresa May was reaching an agreement with the EU. After many months of talks, negotiators for the United Kingdom and the European Union have reached a Brexit breakthrough: a draft agreement on how the U.K. will leave the EU at the end of March. The text of the agreement, which runs to hundreds of pages, has not been released, but U.K. Prime Minister Theresa May is already busy trying to sell the agreement to Cabinet members in private meetings Tuesday evening at London's 10 Downing Street. In the meantime, May's many critics inside her own Conservative Party have attacked the agreement, calling it a surrender to the EU that compromises the integrity of the United Kingdom. Brexiteers are particularly incensed that the agreement reportedly calls for the U.K. to remain inside and subject to the rules of the European Union's customs area until both sides can strike a new trade deal and find a way to avoid building new customs posts between Northern Ireland and the Republic of Ireland. "For the first time in a thousand years this place, this Parliament, will not have a say over the laws that govern this country," former Foreign Secretary Boris Johnson told the BBC. "It means having to accept rules and regulations over which we have no say ourselves." For months, the biggest sticking point between the U.K. and the EU has been how to avoid a "hard" border on the island of Ireland. Currently, the border between Northern Ireland, which is part of the United Kingdom, and the Republic of Ireland, which is part of the European Union, is seamless and practically invisible. Brexit could change that and force the need for customs posts that would anger the thousands of people who cross the border each day. Many also fear such posts could also spark a return to violence from the era of "the Troubles," a conflict from the 1960s to the late 1990s between predominantly Protestant unionists who wanted to remain part of the U.K. and largely Catholic republicans, which cost more than 3,600 lives. On Tuesday, RTE, the Irish state broadcaster, reported that the Brexit agreement might — under certain conditions — require Northern Ireland to be more closely aligned in some regulations with the EU than the U.K. That has not been confirmed, but the report was enough to anger Northern Ireland's Democratic Unionist Party. "An agreement which places new trade barriers between Northern Ireland and Great Britain will fundamentally undermine the constitution and economic integrity of the United Kingdom," said DUP leader Arlene Foster. The Democratic Unionist Party has just 10 seats in Britain's House of Commons, but it has outsize power. The party is propping up May's Conservative Party, which does not have a parliamentary majority, and can provide crucial votes on issues. Without the DUP's support, getting a Brexit withdrawal agreement through Parliament could prove far more difficult. On Wednesday afternoon, May will discuss the agreement with her Cabinet. Many in the U.K. will be watching to see whether it backs her or there are high-profile resignations, which could undermine her plans. If the Cabinet meeting goes well, the EU is expected to schedule a summit toward the end of this month in Brussels to vote on the deal. The agreement would then move to the British Parliament in December, where it could face its biggest battle.